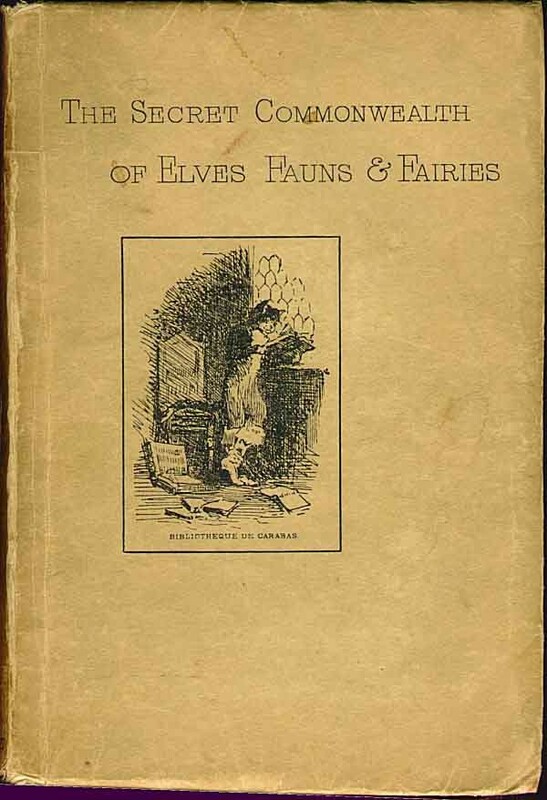 The Secret Commonwealth of Elves, Fauns & Fairies, by Robert Kirk and Andrew Lang - Fiat Lux. This is one of the most sought after and enigmatic texts about Celtic fairies. Written by a Scottish clergyman, Robert Kirk, in 1691, and not committed to print until the early 19th century, The Secret Commonwealth is an unusually sympathetic account of the denizens of fairyland, and a complex of still mysterious extrasensory phenomena including poltergeists, clairvoyance and doppelgangers (here called 'co-walkers'). This version was issued in 1893 in a very limited edition by the renowned folklorist Andrew Lang, and it includes a 'comment' and some endnotes by Lang which are actually about as long as the Kirk material. This book is very rare. I was extremely fortunate to acquire a copy of the first (and to my knowledge, only) edition of this work when it came up for sale at a local used bookstore. This copy is signed on the flyleaf by Uma Jeffers, wife of the poet Robinson Jeffers, and bears their bookmark, "The Hawk Tower, Tor House, Carmel-by-the-Sea". The only version of Kirk recently in print was converted to modern spelling, and it is unlikely that Lang's edition will be readily available to scholars and other interested individuals, unless it is reprinted. Therefore I have taken great pains to retain the spelling and formatting of Lang's redaction of Kirk's text. I have departed from site standards in this section and not merged cross-page hyphenated words. By far the stickiest issue was Kirk's spelling, particularly the 'long' s, which in Lang's book was indistinguishable from normal f. I have used the ƒ character (ƒ) throughout where I could infer the presence of an 's'. In some rare cases I could not decide whether an 'f' or an 's' was implied; these are noted in green italic type. (Annotations in Kirk with square brackets are Lang's).